Hypertension is a circulatory disease. Many patients with high blood pressure develop coronary artery disease or heart failure, and many die as a result. But all parts of the body depend on the circulation, and many organs suffer from the impact of untreated hypertension. One of the organs at greatest risk is the brain. Blood pressure is the vital force that propels oxygen-rich blood to all parts of your body. Your heart is the pump that generates the force, and your arteries are the channels that transport and distribute the blood. The height of your blood pressure is determined by how forcefully your heart's main pumping chamber, the left ventricle, contracts, and by the diameter and stiffness of your arteries. In turn, your heart and arteries are influenced by a large number of genetic, hormonal, metabolic, neurological, psychological, and lifestyle factors that determine your blood pressure. Because these influences are so numerous and complex, your blood pressure can vary from minute to minute and hour to hour during the course of the day, to say nothing of the slower shifts that occur over the course of a lifetime. Blood pressure has two components. Your systolic blood pressure is the higher number, recorded while your heart is pumping blood into your arteries; your diastolic blood pressure is the lower number, recorded when your heart is relaxing and refilling with blood between beats. Both numbers are calibrated in millimeters of mercury (mm Hg), a vestige of the mercury column used in the first pressure manometers more than 100 years ago. By convention, the higher number is recorded first; a systolic pressure of 110 mm Hg and diastolic pressure of 70 mm Hg would be written as 110/70 and pronounced "110 over 70." In adults, normal readings are below 120/80; hypertension is diagnosed at levels of 140/90 and above, while readings between 120/80 and 139/89 are classified as prehypertension. Hypertension is enormously common. Some 74 million Americans — about one of every three adults — has hypertension and about 54 million have prehypertension. Hypertension is also enormously consequential; in fact, it is responsible for one of every six deaths in American adults. Because it involves the heart and blood vessels, hypertension is classified as a cardiovascular disease. But since arteries are vital to the health of all our organs, hypertension is actually a multisystem disease. In many cases, hypertension's most damaging impact does not fall on the heart but on the eyes, the kidneys, and especially the brain. Although an American's risk of dying from a stroke has declined by about 70% since 1950, stroke is still the third most common cause of death in the U.S. Each year, about 800,000 Americans have strokes; nearly 45% die, and many of the survivors are burdened with significant disability. Our economy is burdened, too, since strokes have an annual price tag of about $69 billion. There are two major types of strokes, ischemic and hemorrhagic (see illustration). Hemorrhagic strokes are less common but more cataclysmic; they occur when a blood vessel in the brain bursts, spilling blood into the brain or the fluid that surrounds it. Ischemic strokes, which account for about 87% of all strokes, result when an artery that supplies blood to the brain becomes blocked by a clot. This can happen in either of two ways. 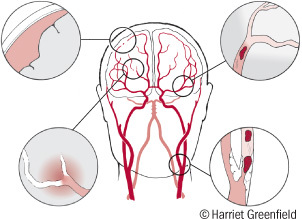 In a thrombotic stroke, the clot forms in a diseased artery within the brain itself. In an embolic stroke, the clot forms outside the brain, then breaks away and is carried by the blood to the brain, where it lodges in a previously normal artery. Most emboli originate on atherosclerotic plaques in the carotid artery or aorta, or in the heart itself. Each of these major types of strokes has a milder counterpart. Although major hemorrhagic strokes are impossible to overlook, MRI studies show that small microbleeds are much more common. Similarly, many people have tiny ischemic strokes, which are classified as lacunar strokes because of their small size. Although a simple microbleed or lacunar stroke is not likely to produce symptoms, a series of these events can produce major problems, including memory loss, or cognitive dysfunction (see below). According to American Heart Association estimates, more than 13 million Americans have had one or more of these "silent" strokes, which are particularly common in people over 60, especially if they have hypertension. High blood pressure is the leading cause of strokes, both symptomatic and silent. Both systolic and diastolic hypertension contribute to risk; the higher your pressure, the higher your risk. According to one Harvard study, hypertension increases a man's risk of stroke by 220%; according to another, each 10 mm Hg rise in systolic pressure boosts the risk of ischemic stroke by 28% and of hemorrhagic stroke by 38%. That's the bad news. The good news is that treating hypertension is extremely protective; in round figures, if you reduce your systolic blood pressure by 10 mm Hg, you should cut your risk of stroke by a whopping 44%. Mental decline is one of the most feared consequences of aging. But although many senior citizens experience some changes in memory as they grow older, most men who remain healthy continue to function at high levels. They learn to compensate for minor changes in the speed of recall and to use the wisdom that has accumulated over the years to maintain the ability to reason and think creatively. Unfortunately, many men don't stay healthy, and many develop cognitive dysfunction. A variety of illnesses and medications can contribute to cognitive dysfunction — and as research continues to come in, it's increasingly clear that hypertension takes a toll on the aging brain. Mild cognitive impairment can be a problem, but it's usually quite manageable. But severe memory loss is a disaster; you may think of it by its old name, senility, but doctors now use the term dementia to characterize these severe disturbances of memory, reasoning, and judgment. Although dozens of neurological diseases can cause dementia, just two account for the lion's share, multi-infarct or vascular dementia and Alzheimer's disease. Multi-infarct dementia occurs when small vessels in the brain become diseased or blocked, depriving brain cells of the oxygen and glucose they need. If enough nerve cells are damaged or killed by the process, memory can't be restored. Alzheimer's disease is different. The problem begins with the accumulation of beta-amyloid, a small sticky protein that interferes with the function of nerve cells and eventually kills off cells, leaving neuritic plaques in its wake. In advanced disease, brain cells become clogged with neurofibrillary tangles composed of a protein called tau. In most cases, the part of the brain that is responsible for memory (the hippocampus) is hit the hardest. Patients with hypertension often have additional medical problems that influence the choice of a blood pressure medication. Here are some conditions that may benefit from a specific class of medication; in every case, a physician should choose the medication that's best for that particular patient. Since hypertension damages blood vessels, it's easy to see how it contributes to vascular dementia. Although the link to Alzheimer's disease is less obvious, research suggests that vascular damage and tissue inflammation accelerate injury. The details vary from study to study, but the weight of evidence now suggests that high blood pressure increases the risk of mild cognitive impairment, vascular dementia, and even Alzheimer's disease. Both systolic and diastolic hypertension take a toll; in general, the higher the pressure and the longer it persists without treatment, the greater the risk. Most investigations focus on older adults. For example, a study of 2,505 men between the ages of 71 and 93 found that men with systolic pressures of 140 mm Hg or higher were 77% more likely to develop dementia than men with systolic pressures below 120 mm Hg. And a study that evaluated blood pressure and cognitive function in people between 18 and 46 and between 47 and 83 found that in both age groups high systolic and diastolic pressures were linked to cognitive decline over time. Doctors may be able to help ease the burden of dementia, but the damage and disability cannot be reversed. That makes prevention doubly important. Can treating hypertension help prevent dementia? Yes. European scientists reported that long-term antihypertensive therapy reduced the risk of dementia by 55%. Several American studies are only slightly less optimistic. One linked therapy to a 38% lower risk. Another reported that each year of therapy was associated with a 6% decline in the risk of dementia; in particular, men treated for 12 years or more enjoyed a 65% lower risk of Alzheimer's disease than men with untreated hypertension. Another study of American men and women linked therapy to a 36% reduction in the risk of Alzheimer's disease; diuretics appeared to be the most beneficial medication. And a team of investigators from Harvard and Boston University reported that six months of antihypertensive therapy actually improves blood flow to the brain, providing a good explanation for the benefits observed in clinical studies. It's good to know that blood pressure control can reduce the risk of cognitive dysfunction. But what about men who already have mild memory loss? Can treating hypertension help stave off further damage? Perhaps. Italian scientists studied 80 patients with mild cognitive dysfunction. Over a two-year period, patients who were given antihypertensive medications were 80% less likely to progress to full-blown Alzheimer's than untreated patients. It's only one study, and a small one at that. And let's hope scientists don't forget to follow up with additional research. For your head as well as your heart, get your blood pressure down. And even if you forget that hypertension is bad for your brain, remember that men with normal blood pressures live about five years longer than hypertensive men. The first step is to know your blood pressure. It seems obvious, but more than 20% of people with hypertension don't know they have the disease. The next step is to know your goal. Even if you are just in the prehypertensive range, you should try to bring your pressure down to a normal reading below 120/80. People with hypertension can use somewhat less stringent goals; if otherwise healthy, a target below 140/90 is reasonable. But for patients with diabetes, chronic kidney disease, coronary artery disease, peripheral artery disease, carotid artery disease, or abdominal aortic aneurysm, the goal is below 130/80. 1. Diet. Reduce your sodium intake to less than 2,300 mg a day; 1,500 mg is the new, though stringent, goal for people with hypertension and for totally healthy folks who are middle-aged and older. Reduce your intake of animal fat and processed foods, but chow down lots of fruits, vegetables, whole grains, fish, and non- or low-fat dairy products. A good diet can lower systolic blood pressure by 10 to 22 mm Hg. 2. Exercise. Moderate exercise is excellent, even outperforming intense exercise in some studies. Walking for 30 minutes a day is one way to lower your systolic pressure by 4 to 9 mm Hg or more. 3. Weight control. Diet and exercise will get you there. An obese person who sheds 20 pounds can expect a drop of 5 to 20 points in blood pressure over and above the benefits of diet and exercise. 4. Moderate alcohol use. Light to moderate drinking to the tune of one to two drinks a day won't raise your blood pressure, but heavy drinking will. 5. Use nonsteroidal anti-inflammatory drugs (NSAIDs) judiciously. Long-term use of NSAIDs (ibuprofen, naproxen, others) can raise blood pressure, particularly in older people. 6. Stress control. It's easier said than done in today's hectic world, but winding down can help you keep your pressure down. Finally, use medications if you need more help. It's another point that should be obvious, but a shocking 55% of hypertensive patients are above their targets. The authoritative JNC7 report recommends thiazide diuretics, ACE inhibitors, angiotensin-receptor blockers, calcium-channel blockers, and beta blockers as first-line medications, but research suggests beta blockers may be less desirable than the others, particularly to prevent strokes. Many experts start with a thiazide diuretic, but if you have particular needs, another drug may be best (see box above). And a combination of two or more drugs is often needed. Cooperate with your family to improve your lifestyle, and work with your doctor to find the medication that will bring you to your target blood pressure safely. It will take patience and persistence, but it's the brainy thing to do.